When is an ‘extinct’ plant actually extinct? This work relates to my new postdoc at the University of Cambridge in Sam Brockington’s group. I’ve been closely examining IUCN RedList data for plant taxa and found some rather odd things. Out of the 100 or so plant species that the IUCN RedList asserts as ‘extinct’, at least 16 of them are growing alive and well somewhere in the world at the moment. For some species even Wikipedia notes the conflict between reality and the ‘official’ IUCN assessment e.g. for Rauvolfia nukuhivensis. Additionally to the 16 above, with less certainty, I also think the Hawaiian taxa Delissea kauaiensis and Delissea niihauensis might have some individuals still alive according to this Department of Land and Natural Resources ‘Fact Sheet’ from 2013. Why not harness the wisdom of the crowds and/or semi-automated text mining? It’s remarkable that the IUCN RedList still lists some of these as ‘extinct’ when there are easily findable peer-reviewed articles reporting the rediscovery and hence extant status of these taxa. To their credit, many are listed as “needs updating” but still, if there are important updates to statuses why not just go in and make the change(s) to correct the record? The IUCN RedList page listing Wendlandia angustifolia as ‘extinct’ is possibly the worst example – it was reported as rediscovered back in the year 2000, more than a decade ago! The IUCN has had 15 years to update their incorrect assertion of ‘extinct’ for this taxon! I can’t possibly go through the literature and check all other IUCN-listed plant taxa myself but this does seem like a great opportunity for ContentMine tools to help the IUCN RedList stay on top of the latest updates about IUCN RedListed taxa. See ‘Daily updates on IUCN Red List species‘ for more on that idea. Below I list sources of information relating to the 16 species that I think are definitely NOT extinct, despite being listed as such on the IUCN RedList. Wahyu, Y., Wihermanto, N., Risna, R. A., and Ashton, P. S. 2013. Rediscovery of the supposedly extinct Dipterocarpus cinereus. Oryx 47:324. Martínez-Sánchez, J. J., Segura, F., Aguado, M., Franco, J. A., and Vicente, M. J. 2011. Life history and demographic features of Astragalus nitidiflorus, a critically endangered species. Flora – Morphology, Distribution, Functional Ecology of Plants 206:423-432. OpenCon 2015 Brussels was an amazing event. I’ll save a summary of it for the weekend but in the mean time, I urgently need to discuss something that came up at the conference. At OpenCon, it emerged that Elsevier have apparently been blocking Chris Hartgerink’s attempts to access relevant psychological research papers for content mining. No one can doubt that Chris’s research intent is legitimate – he’s not fooling around here. He’s a smart guy; statistically, programmatically and scientifically – without doubt he has the technical skills to execute his proposed research. Only recently he was an author on an excellent paper highlighted in Nature News: ‘Smart software spots statistical errors in psychology papers‘. Why then are Elsevier interfering with his research? I know nothing more about his case other than what is in his blog posts, however I have also had publishers block my own attempts to do content mining this year, so I think this is the right time for me to go public about this, in support of Chris. I am trying to map where in the giant morass of research literature Natural History Museum (London) specimens are mentioned. No-one has an accurate index of this information. With the use of simple regular expressions it’s easy to filter hundreds of thousands of full text articles to find, classify and lookup potential mentions of specimens. In the course of this work, I was frequently obstructed by BioOne. My IP address kept getting blocked, stopping me from downloading any further papers from this publisher. I should note here that my institution (NHMUK) pays BioOne to provide access to all their papers – my access is both legitimate and paid-for. So according to BioOne, I swiftly found out that downloading more that 100 full text articles in a single session is automatically deemed “excessive” and “a violation of permissible activity“. Isn’t that absolutely crazy? In the age of ‘big data’ where anyone can download over a million full text articles from the PubMed Central OA subset at a few clicks, an artificially imposed-restriction of just 100 is simply mad and is anti-science. As a member of a subscription-paying institution I have a paid right to be able to access and analyze this content surely? We are paying for access but not actually getting full access. If I tell other journals like eLife, PLOS ONE, or PeerJ that I have downloaded every single one of their articles for analysis – I get a high-five: these journals understand the importance of analysis-at-scale. Furthermore, the subscription access business model needn’t be a barrier: the Royal Society journals are very friendly with content mining – I have never had a problem downloading entire decades worth of journal content from the Royal Society journals. I have two objectives for this blog post. Please get out of the way and let us do our research. If our institutions have paid for access, you should provide it to us. You are clearly impeding the progress of science. Far more content mining research has been done on open access content and there’s a reason for that – it’s a heck of a lot less hassle and (legal) danger. These artificial obstructions on access to research are absurd and unhelpful. I’m absolutely sure it’s not just Chris & I that have experienced problems with traditional publishers artificially obstructing our research. Heather Piwowar is one great example I know. She bravely, extensively and publicly documented her torturous experiences with negotiating access & text mining to Elsevier-controlled content. But we need more people to speak-up. I fear that librarians in particular may be inadvertently sweeping these issues under the carpet – they are most likely to get the most interesting emails from publishers with respect to these matters. This is a serious matter. Given the experience of Aaron Swartz; being faced with up to 50 years of imprisonment for downloading ‘too many’ JSTOR papers – it would not surprise me if few researchers come forward publicly. There’s a 1,000-word limit for this competition, so forgive my brevity. I could easily write ten thousand! These are merely a couple of vignettes. To really understand why open is better, you should try traditional science. Otherwise, you won’t see all the most awful practices as these are usually hidden from view. My first peer-reviewed paper was published in a popular glamour magazine called Nature. Most academics read it for the News and Jobs sections, but it also publishes some research articles too. Editorially, it selects research articles for publication on the basis of their news-worthiness which has unfortunate side-effects: significantly more of these stories eventually get retracted or corrected, relative to other journals which focus more on the correctness of the science. My one-page, one-figure article simply pointed out that an article the magazine had previously published on its front cover was wrong. I wasn’t the only one to notice this either. Amazingly, it took the journal 160 days from submission to publication to publish my small contribution. This was my first author-experience of the vast inefficiency, bureaucracy, and secrecy practised by traditional ‘closed’ science journals. It was thus made obvious to me from a very early stage of my PhD that there had to be other better, faster, cheaper, more-enriched ways of communicating science available. Nowadays I wouldn’t recommend anyone to use the traditional (read: slow, obstructive, secretive) means of post-publication commentary. If you want to communicate what is poor about a paper published at a traditional journal, writing to the journal is the very least effective means of doing so. Use PubPeer, PubMed Commons, blogs, Twitter, or even The Winnower for post-publication peer-review. Making incisive, well-communicated points about research you have read, and sharing these thoughts, openly for others to read and comment on, is a valuable skill. Although hard to evidence, I believe I have gained respect and wider exposure for doing this myself, as have others e.g. Rosie Redfield whom I would not have heard of were it not for her excellent critique of the #arseniclife paper (for those who don’t know the about it: the original paper was published in another glamour mag, and was also subsequently formally-rebutted with neutrally-titled ‘Technical Comments‘ 177 days after online publication, despite Rosie’s much more timely blogged-rebuttal which went online 2 days after the initial publication). I’m not alone in thinking these are glaring examples of how traditional science communication is broken. So one small act of sharing directly-led to Fellowship money, many speaking invites, additional publications/collaborations I wouldn’t have otherwise been involved with, and genuine influence within an academic society. Sharing my presentations, my ideas, my data, and of course my publications has clearly benefited my career, and if anything I’m only likely to go more open with my research in future, rather than less! As my title alludes to, I’m well aware my stories are just anecdata. This isn’t an objective assessment of the benefits of open science, but the logical basis of the benefits are clear nonetheless: if you don’t share your work, less will know of it. Share freely and openly and you may find yourself with many more beneficial opportunities as a result. Go forth and upload your work today! Anyone care to remember how awful and unusable the web interface for accessing the NHM’s specimen records used to be? Behold the horror below as it was in 2013, or visit the Web Archive to see just how bad it was. It’s not even the ‘look’ of it that was the major problem – it was more that it simply wouldn’t return results for many searches. No one I know actually used that web interface because of these issues. And obviously there was no API. 2013. It was worse than it looks. The new Data Portal is flipping brilliant. Ben Scott is the genius behind it all – the lead architect of the project. Give that man a pay raise, ASAP! In my text mining project to find NHM specimens in the literature, and link them up to the NHM’s official specimen records, it’s vitally important to have a reliable, programmatic web service I can use to lookup tens of thousands of catalogue numbers against. If I had to copy and paste-in each one e.g. “BMNH(E)1239048” manually, using a GUI web browser my work simply wouldn’t be possible. I wouldn’t have even started my project. Put simply, the new Data Portal is a massive enabler for academic research. At first, I was simply querying the database from a local dump. One of the many great features of the new Specimen Records database at the Data Portal, is that the portal enables you to download the entire database as a single plain text table: over 3GB’s in size. Just click the “Download” button, you can’t miss it! But after a while, I realised this approach was impractical – my local copy after just a few weeks was significantly out of date. 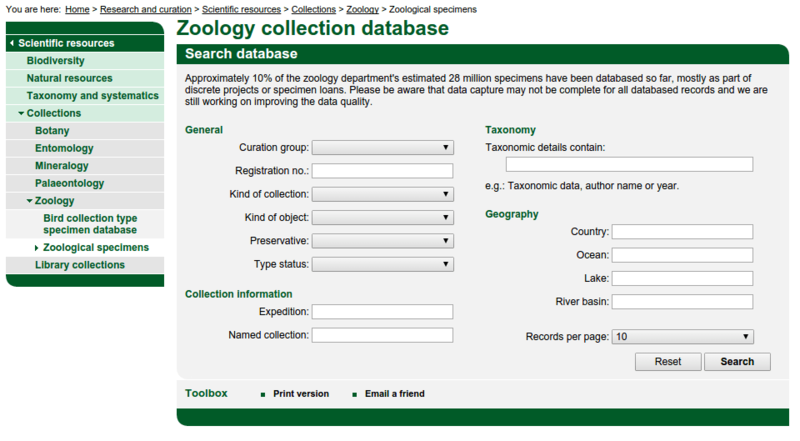 New specimen records are made public on the Data Portal every week, I think! So, I had to bite the bullet and learn how to use the web API. Yes: it’s a museum with an API! How cool is that? There really aren’t many of those around at the moment. This is cutting-edge technology for museums. The Berkeley Ecoinformatics Engine is one other I know of. Among other things it allows API access to geolocated specimen records from the Berkeley Natural History Museums. Let me know in the comments if you know of more. That doesn’t look pretty, so let me break it down into meaningful chunks. The first part of the URL is the base URL and is the typical CKAN DataStore Data API endpoint for data search. The second part specifies which exact database on the Data Portal you’d like to search. Each database has it’s own 32-digit GUID to uniquely identify it. There are currently 25 different databases/datasets available at the NHM Data Portal including data from the PREDICTS project, assessing ecological diversity in changing terrestrial systems. The third and final part is the specific query you want to run against the specified database, in this case: “Archaeopteryx”. This is a simple search that queries across all fields of the database, which may be too generic for many purposes. This query will return 2 specimen records in JSON format. The output doesn’t look pretty to human eyes, but to a computer this is cleanly-structured data and it can easily be further analysed, manipulated or converted. NHM Catalogue numbers are unfortunately far from uniquely identifying but that’s something I’ll leave for the next post in this series! Isn’t the NHM Data Portal amazing? I certainly think it is. Especially given what it was like before!